To sum up my monthly spending and budget report for August 2012 in one sentence... "Its been a great month with high earnings and low spending". You may remember that last month was the highest spend month with security bars fixed and the likes. . There are no highlights for August. I just had a boring month as most may know, building wealth involves the same routine month after month, lonely at times but overall, its way to exciting to know you live at own terms. I wrote about my feelings mostly. Real Estate 63% 46% The extra I got from hubby kind of toned this down. I really need to boost my other investments to catch up with my rental income. Hubby Allowance 32% 49% This month hubby gave me cash gift so I can spoil myself. I still am thinking of what I'll buy. Thinking along the lines of a gadget. Some tablet, I think. Once Off 0% 1% Interest free loan I gave to a friend. She is paying monthly. Online 0% 0% I will get two months worth this month. Extra 4% 4% Interest on my Emergency Fund. Dividends were ZERO again. Interest on my Emergency Fund is always a welcome addition. Dividends were ZERO again. Real Estate 25.1% 13.6% My one and only mortgage. I decided to pay all the home owners association fees and taxes/rates three months in advance so I dont pay them monthly. I will only pay these end of September/ beginning of October. RA & Unit Trusts 7% 6.2% Fixed for my life insurance and the rest of small investments and savings. Consumer 1.6% 1.8% Most shopping was done by hubby. Giving 44.2% 11.2% Back to normal. This is usually between 11% and 15%. Last month was crazy with loans to friends and more gifts. It got to almost half my income. To Invest 20.2% 66% WOW!!! My focus is paying up my homeloan. I also top up my Just Invest (Nedbank) to grow by R5000 per month. Whatever interest I get, I top up to make it a round R5000 figure. This serves as my emergency fund account. My leftover cash was 66%. I lived on 34% of my income in August. That's amazing. As usual I topped up my emergency fund by R3800, paid some in my home loan account. Remember in July I ended with a negative balance sheet statement with a - R2800 balance for the month? This month I ended up with lots to smile about. I said I will be paying all my extra income into my homeloan to fast track bond payment. I changed my mind. 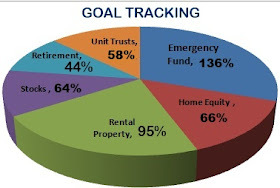 If things go well, I may use part of my emergency fund to finance the rental property I am buying in a small SA town. I am paying cash for it and have the tenants waiting for the registration already. Its promising to be a brilliant deal.